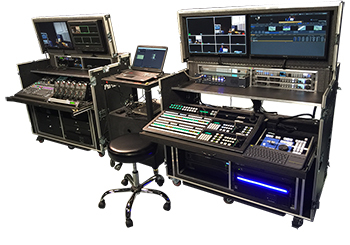 ESPN3 Broadcast System built for Sam Houston University. We have done this for clients as large as Discovery Channel, Univision, ESPN, Universities, small Schools, Churches and developing startup companies for over fourteen years. How much is a mobile production system? The answer is from $75,000 to $1,000,000 dollars. How much for a complex video production studio? The answer is from $50,000 to $25,000,000 dollars. The total price can vary greatly between $75,000 - $25,000,000 depending on the appropriate selection of components for switching, monitoring, intercom, recording, graphics, replay, cameras, long distance (fiber) camera connectivity, streaming, environmental systems, power requirements, onsite commissioning/training, etc….as well as many options and accessories within each category. This consists of asking a series of questions to determine exactly what you want to produce. For example, if you are planning on building a Production Studio. What types of productions do you produce: live events, sports, talk shows, etc..? Will you be shooting on location or traveling with the system? How are you going to distribute your end product (over-the-air, via satellite, or streaming on the Internet)? Will you need an intercom system, fiber base systems, streaming capabilities, etc...? Without these answers, we do not know what equipment and/or how much equipment will be required. The answers to these and dozens of other questions help us determine the “scope of work”. This will state what you are going to be producing, what types of productions and how it will be executed. Once you approve how everything will flow we can move to the next step which is creating a “Workflow”. This is a large draft that shows us the principle elements of production such as; type of Case, Cameras, Switchers, Encoders, etc… This is a presentation of how your system will work. This is critical because a poorly designed workflow can result in a system that is not able to function properly for your specific needs. Conversely, a well-designed workflow will result in efficient production and smooth operations. It will also allow future expansion without waste. Having performed the above procedures, we now have enough information to do the preliminary engineering. With that completed, we can generate a detailed list of equipment. This will typically consist of hundreds of items from dozens of manufacturers. It always includes many conversations with the manufacturers as models and prices are constantly changing. In short, this is a time consuming process. Complex calculations have to be made to estimate the time it will take to design the system, create the workflow, acquire all of the equipment, install it, wire it and produce proper labels, diagrams and operations manuals. Finally, we include costs for onsite commissioning/training, and freight if applicable. As you may expect, the above work cannot be done by a simple clerk. It requires the expertise of highly qualified Production Engineer/s with years of experience. Employees with this kind of experience are in high demand with salaries and benefit packages typically in excess of $175,000 a year. Less expensive, less experienced engineers end up costing you more money because they specify too much equipment or too little equipment to get the job done. Even worse, they may specify the wrong equipment. In order for Mobile Studios Inc. to provide you with meaningful advice and equipment costs, we require that you enter into a Consulting Agreement which includes a Consulting Fee dependant on the type of system you will require. Should you choose to retain us, we look forward to designing a system for your specific needs in the most cost-effective approach. We can determine this exact Fee after a brief telephone conversation. When you decide to place the order with our company for the system we have designed for you, the Consulting Fee will be applied as a credit against the total purchase. If you decide to purchase the System from another Source the Consulting Fee is non-refundable. The Consulting Fee can range anywhere from $2,000.00 – $5,000.00 contingent to the system you want to have built.